The cleanup and repair work continues in Petersburg at the site of last weekend’s landslide into a downtown stream. The event was caused by heavy rain and took out a large section of parking lot and hillside behind the public works building on Saturday, filling part of Hammer Slough with a big pile of debris. The city has since built an access road to the bottom of the slide. A worker cuts down a tree along one side of the slide and a backhoe digs nearby. A newly built gravel ramp provides vehicle access to the huge pile of rock, soil, bushes and trees below. Public Works Director and acting city manager Karl Hagerman says the city finished the access ramp Monday. 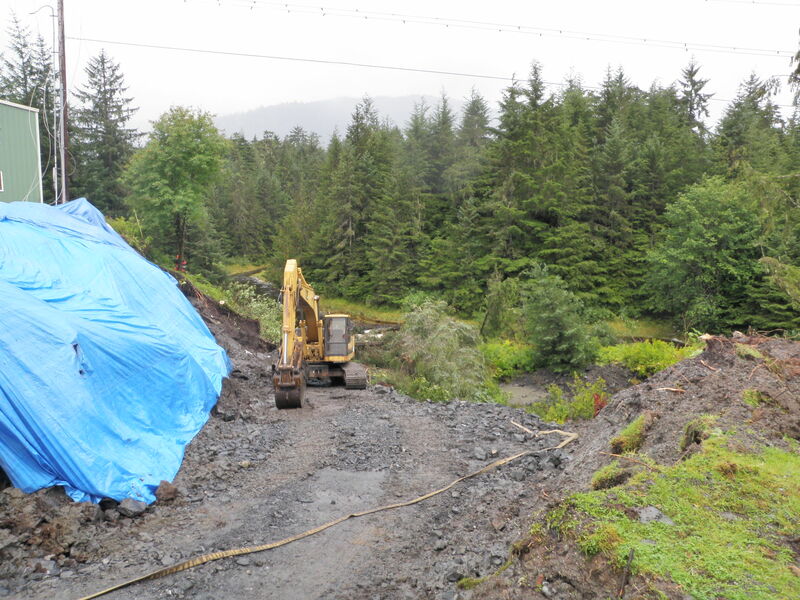 A few pieces of fence and guardrail stick out of the debris pile and tarps cover the steep face of the drop-off left behind by the slide above the slough. The creeks’s still flowing, though it has shifted to the south and flows around the pile over the unoccupied, grassy bank adjacent to its original path. The idea being that too much disturbance could send a lot of the debris downstream and cause more problems for the small fish run in the slough. As far as fixing slope and preventing another slide, the city has an engineer from Peratovich Nottingham and drage working on that. Hagerman says the city has now submitted its written disaster declaration to the state in the hopes of getting some financial and technical assistance with cleanup and repairs. It can be a lengthy process and Hagerman says he’s been lead to believe it can take a couple weeks to a month, so any reimbursement may be a ways down the road. Hagerman says the city has also requested assistance from the National Resource Conservation Service. He thinks the city could qualify for funding through the federal agency’s emergency watershed protection program. In the meantime, the city is looking at spending up to $250,000 on the site for now.